How does a lightweight flywheel work? Firstly, it should be explained that a lightweight flywheel does not increase the power output of an engine, but does increase vehicle performance by increasing the power output to the driving wheels. It does this by reducing the power losses within the transmission system of the car, therefore making more engine power available to accelerate the vehicle rather than accelerate engine and transmission components. If measured on a dynamometer, there will be no change in power output after installing a lightweight flywheel but the speed at which the engine, and therefore the vehicle, will accelerate will be improved. This is because although a few pounds may not sound much considering the overall weight of a car, a gearbox acts as a lever and therefore significantly changes the mass of the car that the engine “sees” in lower gears. Taking this leverage ratio into consideration, a lightweight flywheel can effectively reduce the vehicles mass as far as the engine power is concerned by 10% in first gear! Whilst gear and differential ratios, tyre sizes and vehicle/flywheel weights vary, a good example is a BMW 5 series with a dual mass flywheel. Such an M5 or 540 will have a virtual mass reduction of almost 400lbs in first gear, 150lbs in second gear dropping gradually as the leverage ratio reduces down to around 30lbs in sixth gear. As a general guide, a weight reduction of 10lbs is equivalent to around a 1bhp increase in power so it can be seen in the above example, fitting a lightweight alloy flywheel will give the same performance increase as adding 40bhp to the engine output in first gear. Free horsepower! 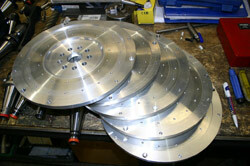 There are a number of other considerations when installing an aluminium flywheel. Firstly, when worn, instead of needing to replace the whole flywheel, the friction surface only can be replaced, and should the starter ring gear wear, this also can be renewed alone. Additionally, the stress on the crankshaft is significantly reduced due to the reduction in rotating mass and the unreliability of the dual mass flywheel (where fitted as stock) is eliminated. 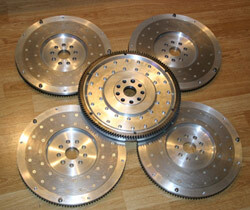 PhoenixMotorsport manufacture the flywheels from some of the finest materials available. The main flywheel body is manufactured from a solid billet of HE30 aerospace grade aluminium and the friction plate from a disc of EN9 carbon steel. All fasteners are grade 8.8 to 12.9 depending on function and the ring gears are usually sourced from the vehicle manufacturer directly for perfect fitment and ease of replacement. 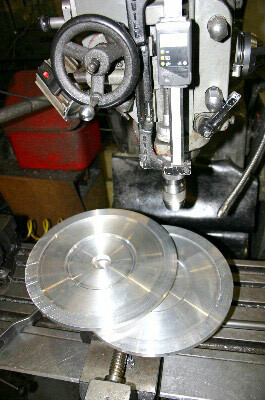 Being a manufacturer and not just a supplier of other companies’ products, we can manufacture flywheels to suit your choice of clutch, such as an RS Turbo Ford clutch on a Fiesta 1000cc OHV flywheel, or an M5 BMW clutch on a 325i flywheel. Please contact us for a quote on a special or one of our more popular applications.